Treasury Bonds are medium to long-term debt securities that carry an annual rate of interest fixed over the life of the security, payable semi-annually. All Treasury Bonds are exempt from non-resident interest withholding tax (IWT). This table is updated on a weekly basis. *If the coupon interest payment date is not a business day, payment will be made on the next succeeding business day without payment of additional interest. There is an active secondary market for Treasury Bonds. The Australian Financial Markets Association (AFMA) has published conventions that apply to trading in the over-the-counter market of long-dated debt securities such as Treasury Bonds. Active Treasury Bond market makers are listed in How to Buy AGS. The AOFM holds regular tenders for issuance and buybacks of Treasury Bonds. Syndicated issues of Treasury Bonds are conducted from time to time. For details of coming transactions, see Forthcoming Transactions or subscribe to the AOFM email service. The Information Memorandum for Treasury Bonds [PDF 792KB | RTF 1.215MB] provides detailed information concerning these securities including the terms and conditions of their issue. 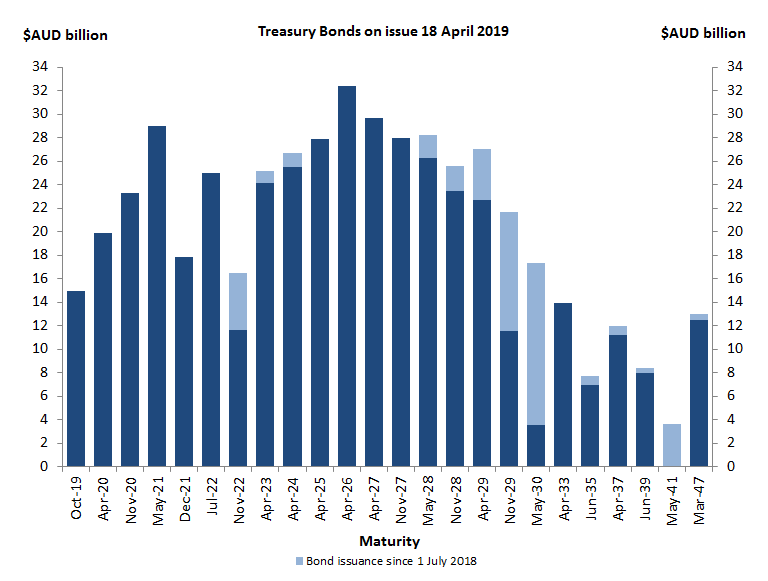 Similar to most fixed income securities trading in Australia, Treasury Bonds are both quoted and traded on a yield to maturity basis rather than on a price basis. This means the price is calculated after agreeing on the yield to maturity. The price is calculated by inputting the yield to maturity into the appropriate pricing formulae. P = the price per $100 face value. P is rounded to three decimal places in formulae (1) and (2), and unrounded in formulae (3) and (4). annual percentage yield to maturity divided by 100 in formula (3) and (4). Melbourne or Sydney) is used in the calculation of f.
Settlement amounts are rounded to the nearest cent (0.5 cent being rounded up). As an example of the working of the basic formula, the price of the 2.75% 21 November 2028 Treasury Bond, assuming a yield to maturity of 2.8300% per annum and settlement date of 27 October 2017, is calculated to be $100.431. In this example, i = 0.014150 (i.e. 2.830 divided by 200), f = 25, d = 184, g = 1.375 (i.e. half of 2.75) and n = 22. If the trade was for Treasury Bonds with a face value of $50,000,000 the settlement amount would be $50,215,500.00. The ex-interest period for Treasury Bonds is seven calendar days. With ex-interest Treasury Bonds the next coupon payment is not payable to a purchaser of the bonds. In this case, calculation of an ex-interest price is effected by the removal of the ‘1′ from the term in formula (1), thereby adjusting for the fact that the purchaser will not receive a coupon payment at the next interest payment date. When a Treasury Bond goes ex-interest for the second last time it is treated as a special case. In this case formula (3) applies up until the record date for the final interest payment and formula (4) applies from the time the bond goes ex-interest for the final time. There may be a slight discontinuity in the progress of the price of the bond around the time the bond goes ex-interest for the second last time but market participants can, if they wish, allow for this in their trading. Where the maturity date coincides with a weekend or public holiday, the commonly accepted practice is to price near-maturing Treasury Bonds according to the actual date the principal and final interest are paid (and not the nominal maturity date).